IN THE EARLIER PICTURES of Mont Sainte-Victoire, the mountain was seen at a considerable distance, and its place in the broad panorama gave it a greater repose. Here, CИzanne comes closer to the peak; but it is even more inaccessible than before. Instead of suspending the observer above the valley, he places between him and the main object an abyss, the quarry across whose void he views the opposite rocks and the rising peak. In this process, the landscape itself has become dramatic, filled with striving, titanic energies; but these are outside the spectator's realm, beyond approach. The mountain, like a heroic sculpture, is set on a gigantic pedestal of rock enclosed by trees. One side rises in a sheer unbroken slope, the other, a strangely animated line, changes its course in several abrupt breaks. For the first time we see the peak as a personal object with a distinct profile, or with two sides, like a human face. It has lost the old classic symmetry and has become a complex, dynamic form. 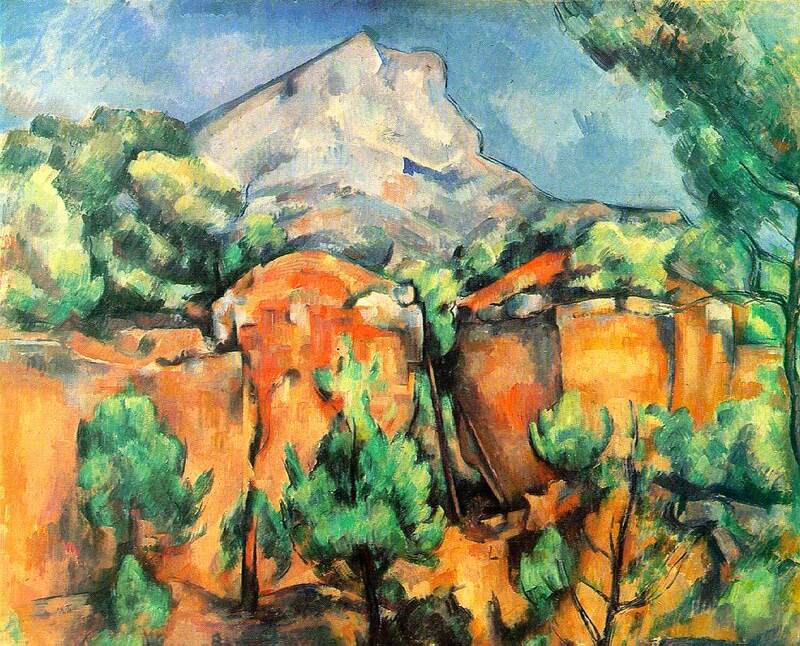 At the same time, its elevation, its strained upward movement, is more pronounced because of its position in space--close to the upper edge of the canvas and directly above the vertical walls of the quarry. There is no broad horizontal plane, no immense platform of earth, to tranquillize the natural pyramid, but a deep vertical cleft at its convex base, splitting the quarry wall in two and marked by unstable, tilted trunks, adds to the restless effect in this setting of great pressures and heat. The taste for the vertical plane, which we have observed in the Louvre still life as typical for the late style, is realized in this landscape with a grandiose force, but with another expressive sense. The mountain is as distinct as the nearest objects, even more distinct if we compare its drawn outline with the vaguer (sometimes vanishing) silhouettes of the trees below. As we move from the foreground to the distance, the objects become larger, as in a primitive emotional perspective. The great mass of the tree at the upper right seems to belong to the same region of space as the mountain, and only when we follow the wavy line of its trunk along the edge of the canvas do we recognize its true place in the foreground. Very similar greens occur in the foreground and distance, uniting their far-separated planes in a common scheme of accents. The strongest contrasting chord, the orange rocks and blue sky, also binds the most distant space and the nearest. A scale of lavender, rose, and purple tones extends across the same depth. As in the still lifes, this closer view is associated with a greater intensity of sensation. There are few landscapes before CИzanne in which orange and blue are applied in such large, luminous contrast. CИzanne stood here near a deep excavation beyond which rise large orange rocks with sharp edges where blocks have been extracted. Above them hovers Sainte-Victoire as though quite nearby, yet between the quarry and the mountain extends a valley with the village of Le Tholonet; toward the left the Gorges des Infernets with the Zola dam are hidden. To the right of this spot stood the cabanon where the painter stored his gear. This is his most panoramic representation of the picturesque quarry, whose individual rock formations he usually studied from a nearer position. Even before CИzanne's mother died in October 1897, he seems to have ceased working at the Jas de Bouffan. In August of that year he invited a friend to join him at eight in the morning at Bibemus or meet him later for lunch at Le Tholonet--a long and steep walk downhill (his carriage probably picked him up there after the meal for the return to Aix). He continued painting at the quarry throughout September; it is likely that this landscape was done at that time, since both in color and execution it shows some similarities with the Geffroy portrait of 1895. The rocks and the ground, interspersed with vivid greens, are of a strong orange. Between them and the very blue sky extends the bluish-purple and pink wall of the mountain, traced by a delicate blue outline. Blue-black brush lines also appear elsewhere. There is a greater accumulation of brushstrokes in the center. Although the canvas is completely covered, the upper two corners are thinly painted, especially the one at right.